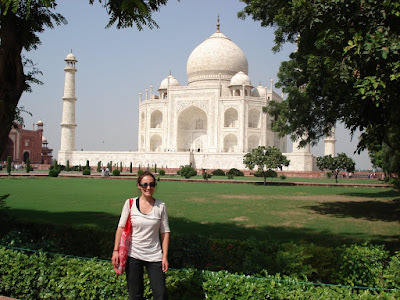 At the top of many a traveler to India's to see list is the Taj Mahal. 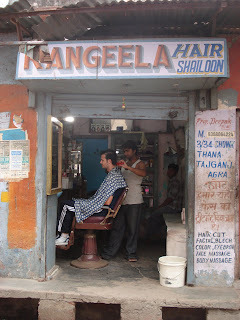 Katrina saw it on her first day in India last year, and it was our first destination on this trip after leaving Delhi. The ride on the rails to Agra took about four hours, most of which we spent snacking on delicious sw eet burfi and 10 cent chai from the vendors that came up and down the aisle. Arriving after dark, hot and sweaty, we ignored our inner bargainers and crashed at the first hotel we found. We were happy that our sleepiness distracted us from the mosquitos that infested our run-down room. 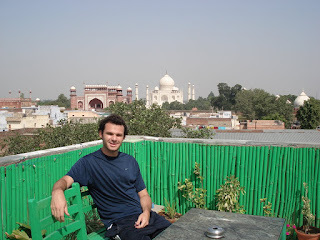 It wasn't until the next morning when we made our way to the rooftop restaurant for breakfast that we realized that a few floors above our room at Shanti Lodge were rivaled breathtaking views of the Taj Mahal. We say rivaled because there were more than a handul of similar hovels with rooftop views within spitting distance. Regardless, it was a pretty nice backdrop for sipping chai and eating stuffed paranthas. It took us less than five minutes to arrive at the south gate entrance where there was no line or crowds, leaving us somewhat unsure if we were in the right place. Thankfully, an eight-year-old directed us where to buy tickets and invited us to visit "his shop" after. It was as if he had been working the street for years, which wouldn't be out of the realm of possibility. Next thing you know we were in the presence of the Taj Mahal! Katrina got the introductions out of the way quickly..."Taj Mahal meet Patrick. Patrick...Taj Mahal." The sun relentlessly beat down on us as we walked along the long reflecting pool, through the green, manicured grounds and up to the tomb. What can we say? It's incredible. Smooth white marble, inlayed gems, everything in massive proportions...yeah, the Taj Mahal is pretty cool. Agra, on the other hand, is pretty miserable. The town is dumpy with children gathering fresh cow piles off the street as a valued commodity. Tourists are essentially stalked by shopowners inviting them into their kitsch caves, rickshaw drivers selling rides, and beggars of all ages pleading for spare rupees. It's a very sad place and we were eager to leave as soon as we were done with our Taj visit. View more pictures from Agra here. la combustion des graisses et donc avoir l'impression de toujours avoir faim.